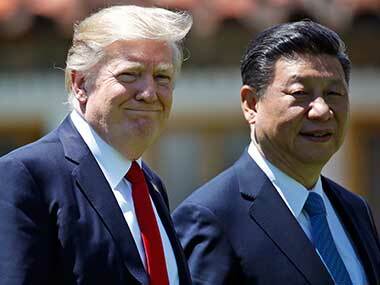 Seoul: Chinese President Xi Jinping has been "very helpful" in dealing with the threat posed by nuclear-armed North Korea, US President Donald Trump said Tuesday, a day before he heads to Beijing. Pyongyang was "a worldwide threat that requires a worldwide action", according to Trump, but he said that Xi "really has been very, very helpful". "We hope that Russia likewise will be helpful," he added. China is the north's key ally and diplomatic protector, their alliance forged during the Korean War when hundreds of thousands of Chinese "people's volunteers" died fighting US-led United Nations troops. But while Beijing has become increasingly frustrated at its neighbour's nuclear antics, seeing them as destabilising the region, it says its power to influence Pyongyang is limited. China is the source of around 90 percent of the North's commerce, and under Trump, Washington has consistently urged it to do more. "All nations must implement UN Security Council regulations and cease trade and business entirely with North Korea," Trump said. "It is unacceptable that nations would help to arm and finance this increasingly dangerous regime."